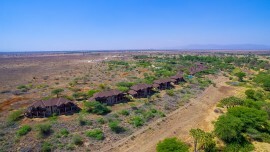 Samburu Sopa Lodge is nestled in Samburu National Park, next to the new Oryx airstrip. The lodge is perched on a hill offering a scenic view of Mt. Kenya and the Samburu hills. Sopa lodge is built to reflect the architectural heritage of the local communities which include the Samburu people cousins to the famous Maasai. 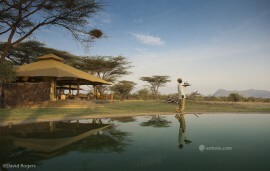 Samburu Sopa Lodge has fifteen cottages built in an arch style to surround the water hole where wildlife comes to refresh and take a swim. 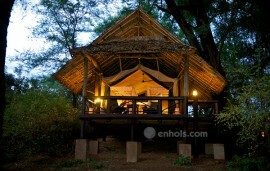 Each cottage has two bedrooms each ensuite and a private veranda that offers panoramic view of the vast Samburu land. The public area is spacious with views of the surrounding area. 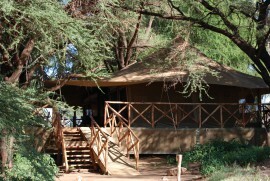 The design blends in with the area, to keep up with the style of the housing by the local Samburu people.